Arne Duncan stood before the NAACP convention last week [JULY 14, 2010] to repeat his claim that “education is the civil rights issue of our generation.” He also declared that “the only way to equality in society is to achieve equality in the classroom.” Since Mr. Duncan did not spell out what he meant by equality or civil rights, let’s see if we can extrapolate his meaning from the policies he is pushing hard to be adopted across America, even if his heavy-handed forcing means ignoring the lawful Congressional role in making federal education policy. When he was Chief Executive Officer of Chicago's public schools, Arne Duncan promoted racial segregation in the city's charter schools. 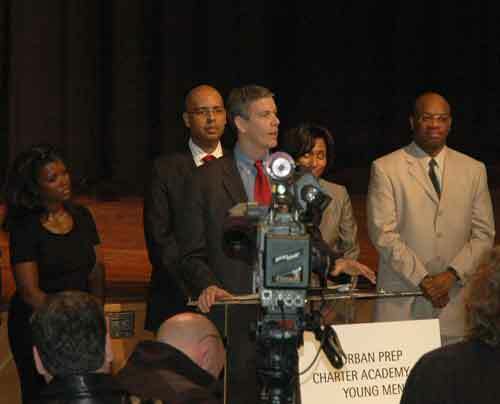 At an April 7, 2008 media event (above) staged at what had been Chicago's Englewood High School, Duncan stood with public officials, charter school operators and promoters, and the segregated all-boys Urban Prep students to announce a new round of RFPs (Requests for Proposals) to start additional charter schools. During Duncan's years as CEO of CPS, the city created nearly 100 charter schools (and "campuses") under Mayor Richard M. Daley's 'Renaissance 2010' program. More than 90 percent of them were completely segregated, most for minority children. Substance photo by George N. Schmidt.Apparently, Mr. Duncan does not believe that the equality shortage in classrooms that we have known about ever since poor children started going to school can be helped by fair housing policies, better transportation policies, improved health policies, or new jobs policies, any of which we know could affect the poverty levels of urban and rural America, where rates are now the highest, after taxes, of any industrialized nation. According to Mr. Duncan, it would seem that policy shifts or new efforts in these areas are unimportant, for it is “only” in the classroom that we may hope to achieve equality. Secondly, it is a harsh, punishing kind of equality centered on remediation, since the “let a thousand flowers bloom approach to charters” has been replaced by an urgency to ramp up and bring to scale the “no excuses” KIPP schools and the KIPP behave-alikes. In these schools, equality demands total compliance by children who go to school nine or more hours a day and then have 2 to 3 hours of homework each night. Plus Saturdays and part of the summer. In order to be equal in these school and, thus, make up for the poverty that puts these students behind, they must be willing to give up their childhoods, family, and friends for a chance at passing the necessary tests that may or may not prepare them for college some day. For even though the “no excuses” chain gangs remains the dominant model for corporate education reform, we know very little about how these children will fare in independent learning environments after years of total compliance and behavioral/psychological modification. By April 7, 2008, when Arne Duncan stood before the stage at Chicago's Urban Prep charter high school (above), the official narrative in Chicago was ignoring intense racial segregation and extreme poverty as problems for urban schools. Instead, Arne Duncan, under Mayor Daley's 'Renaissance 2010' program, was shutting down inner city public schools (based on test scores), firing hundreds of African American teachers, principals, and other school workers, and turning their building (like the Englewood High School building, above) into segregated charter schools, which then received massive uncritical media support. Urban Prep is still gathering praise from corporate media despite the fact that it is doubly segregated: the all-boys' school is also all-black. Substance photo by George N. Schmidt. Thirdly, it is the kind of equality that denies the importance of the other massive inequalities within the communities where these poor children live. It is the kind of equality that does nothing to aid the child who must dodge bullets on the way home from school or return home to find nothing to eat. It is the kind of equality that refuses to enroll a child whose parents are not willing to sacrifice their child to a schooling regimen that parents of the leafy suburbs would consider abusive to children if it were their own being subjected to it. Fourthly, it is the kind of equality that depends upon assessments that put poor children at a great disadvantage all along the line, for there is no standardized test used in schools today, whether in third or thirteenth grade, that does not show, on average, a direct correlation between family income and testing outcomes. COMPLETE TEXT OF ARNE DUNCAN'S SPEECH TO THE NAACP ON JULY 14, 2010. Equity and Education Reform: Secretary Arne Duncan's Remarks at the Annual Meeting of the National Association for the Advancement of Colored People (NAACP). JULY 14, 2010. PROVIDED BY THE U.S. DEPARTMENT OF EDUCATION. Good morning. And thank you. President Obama often says that the story of the civil rights movement was written in the classroom — and for some time now, I have been saying that education is the civil rights issue of our generation. The steady movement to a more fair and just society plays out every day in classrooms, colleges and universities all across America — and I believe that the only way to achieve equity in society is to achieve equity in the classroom. So thank you President Jealous, for your powerful and passionate voice on the issue of education. You have challenged us in important ways and we have heard you. We have learned from you and because of you and your colleagues in the civil rights movement we are increasingly focused on what we need to do at the federal level — and the state and local level — to advance equity through education reform. And after a year and a half in this job — I have a greater appreciation for the scope of the challenge and an even greater sense of hope that we can meet it. On a side note, I should add that I am extremely worried about the jobs crisis — with districts all across America balancing their budgets by cutting educational programs and jobs. This crisis will affect low-income children more than others. Our administration, along with many members of Congress, are pushing hard for a $10 billion dollar education jobs bill to stave off this catastrophe and I urge you to stay engaged on this issue because layoffs and cutbacks are the last thing we need right now in our classrooms and schools. In the last 18 months, I have been to nearly every state in America. I have been to a tiny fishing community in western Alaska without running water or electricity. I visited an Indian reservation in Montana where unemployment was in the 80's. I have visited big cities and small towns. I have seen phenomenal schools filled with hope and struggling schools marked by despair. I have met courageous principals who are shattering the myths that poor children cannot learn — by building a culture of high expectations and demanding more of everyone — from parents to teachers to students themselves. I have met hero teachers who chose to work in the toughest school districts and serve students of need. Every day they go far beyond the call of duty — serving as mentors, friends, counselors and even surrogate parents. I have met eager young students who live with violence, poverty and social breakdown and still get up and go to school each day because they are so desperate and hungry to get an education. I have met tireless and determined parents who insist on a quality education for their children and take responsibility every day to insure that their kids are well-rested, well-fed and prepared. I have learned that success is possible under any circumstances as long as the adults can put aside their differences and focus on children and their interests. But I have also learned a lot about the barriers to success in education — barriers that have built up over years and years and which we are only now beginning to challenge. Those barriers start in the home where too many children spend too much time with TV instead of with books and where some parents — overwhelmed by the demands of work or by their personal demons — are simply unable to meet their responsibilities. It continues in schools where educators lack the resources, the support or the motivation to devote the time and energy needed to help all of our neediest children learn. It includes stakeholders from administrators and elected officials to labor and community leaders — who either under-invest in education or set up rules that do not serve the interests of children. From the first day of this administration, we have systematically confronted these barriers — challenging parents to take more responsibility, challenging educators to work harder in chronically under-performing schools — and challenging students to take more responsibility for their own education. We have challenged administrators and unions to show courage in fixing our worst schools — and we have challenged governors and state legislators to adopt high standards, fund schools fairly, and change laws that stand in the way of reform. We have provided billions of dollars to states and districts willing to challenge the status quo — and we have brought together parents, teachers, principals, unions, and administrators and fostered some difficult but very necessary conversations around children and their education. We have challenged everyone to go outside their comfort zones — to be transparent about our shortcomings — and to explore creative, new ways of teaching and learning. And today, all across America — educators, parents and community leaders are engaged in a healthy, robust and sometimes noisy debate about how we can better prepare our children for the global economy. Not surprisingly, we've encountered resistance from some people who say we need to slow down. And that's when I go back to a jail cell in Birmingham, Alabama in 1963 where Dr. King wrote an eloquent response in the margins of a newspaper to some ministers who urged him to suspend his protest — avoid confrontation — work through the courts — and basically slow down. His response was titled "Why We Can't Wait." I know you know it well — so I won't quote from it — but I think about it every day — and about the urgency of our work. I think about the fact that landmark court rulings from a half century ago have yet to pay dividends for millions of poor children of color. These children have only one chance for an education — and it is our moral responsibility to act swiftly and dramatically to change educational outcomes for these kids. I think about Dr. King coming to the West Side of Chicago in 1966 to protest unfair housing — and about the billions of dollars that followed him into those communities for housing, job-training, community development and social services. These are all important investments — but somehow they forgot education — the one investment that can really transform whole communities and create real and lasting opportunity. Today, many people on the West Side of Chicago are still poor, unemployed and cut off from society. I think about the persistent achievement gap in this country — where minority kids learn much less and do much worse than White children — year after year. I think about the fact that one in four students in America drops out of high school — and in the minority community it's closer to one in two. We're sending 1.2 million kids into the streets each year without an education. It's economically unsustainable and it's morally unacceptable. This President understands the power of education to change lives. His personal story and his wife's story are all about education. In a world where knowledge is the currency and global competition is the reality, the President has asked America to raise her sights and her hopes. He has challenged us to produce the world's highest-percentage of college-educated people by the end of this decade — and he has put his political capital behind this effort. Last year's Recovery Act included $100 billion dollars for education. That money saved or created 400,000 jobs — most of them teachers — and protected millions of children from cuts in key educational programs. Through our student lending reforms that passed Congress earlier this year, we have put $2.5 billion dollars into colleges serving high-minority populations — including a billion for Historically Black Colleges and Universities. It is now helping millions of young people — and especially low-income minorities — pay for college with an additional $40 billion dollars in Pell grants. We have put $2 billion dollars into community colleges that serve many low-income and minority students and we have also put $750 million dollars into programs that help all of our students stay in college and graduate. Finally, we are helping college students manage their college debt by limiting their monthly payments, forgiving college debts after 10 years if they choose public service, and regulating the higher education industry so as to protect both students and taxpayers from high default rates. We are also driving reform in unprecedented ways — uniting educators and community leaders around bold strategies to transform whole school systems and states. Through the Race to the Top competition, we have unleashed a deluge of reform activity in 46 states and scores of cities all across America — reforms that will have an outsize impact on minorities. Those efforts are beginning to take root, but we still have much further to go and I am here today to ask you — as the conscience of society — and as America's most prominent advocates for equity — to be full and active partners in education reform. If we are going to close the achievement gap and ensure equity — then we must push hard and work together on reform. America needs to hear your voice — telling the hard truths — pushing back on the forces of neglect and indifference — and demanding educational equity. Anything less is an assault on the core values of fairness, justice and truth that are at the heart of the American experience. These values have sustained us through war, economic depression, and social upheaval. They prompted visionary leaders more than a century ago to establish colleges for African American men and women who were denied access to the White schools. We owe it to the civil rights leaders of the past to keep faith with these core values and make them real for every new generation and that is what education reform is all about. These same values also created the Office for Civil Rights in the Department of Education — giving us the power to drive equity in the classroom. We have rejuvenated our Civil Rights office after years of drift. Already this year, we have launched dozens of equity investigations around issues like school discipline, teacher quality and access to rigorous high school courses that prepare students for college. When the data shows that black boys are far more likely to be disciplined and suspended from school for minor infractions — or where disadvantaged children lack access to quality teachers and rigorous coursework — we will challenge them and use all of our power to force change. When we see schools that are quietly resegregating by gerrymandering attendance boundaries — we will challenge them. Equity is now woven through our entire agenda from critical formula programs that serve low-income, homeless, English learner and rural students as well as students with disabilities — to bold new grant programs that are driving local and state-level reforms. We are sharpening our focus on closing the achievement gap, getting great teachers and principals into schools serving low-income and minority students, and encouraging high standards that prepare all of our students for college and careers. The need is so great but the potential is even greater and the proof of what is possible is all around us. Let me tell you about one school in Chicago called Urban Prep. This is an all male, all Black school we opened four years ago in one of the toughest neighborhoods in the city. Urban Prep replaced a public high school where only four percent of incoming freshmen were at grade level and more than half the students were dropping out. Last month, Urban Prep graduated 107 students — its first graduating class — and every single one of them has been accepted to a 4-year college. These are the same children who could not learn and who were dropping out. They are from the same families in the same school building, living in the same violent, dysfunctional community. And yet Urban Prep produced dramatically different outcomes. 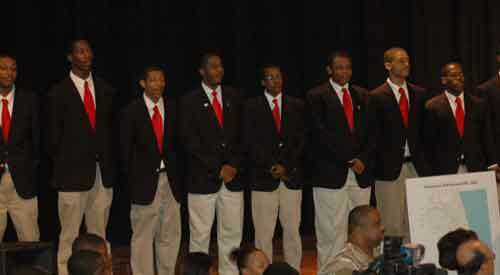 And the question is — how can we make Urban Prep the norm — instead of the exception? How can we make every school a place where expectations are high and learning is valued? How do we get the nation to understand that it is educational opportunity, not poverty, that shapes destiny? When will we stop making excuses for poor performance? We begin with the understanding that children do not all start from the same place. Children from poor communities face greater challenges and often have fewer resources. That's why we are absolutely committed to preserving and strengthening critical formula programs for children at risk — and we are targeting competitive programs toward areas of greatest need. That's also why we will require districts to report civil rights data around issues like resources and access to curriculum. We will examine this data through the lens of equity and not only look at whether the inputs are equal — but whether the outcomes are equal. We know that children of color and children of poverty trail behind white, middle class students in terms of test scores, high school graduation rates and college completion rates. But it's not enough to define the problem — we need to address it. So — we will create a system of accountability that not only exposes achievement gaps — as the current law does — but goes further by requiring districts to close them. And that begins by getting the best teachers to work in the schools where they are needed most. Today, our education system encourages the great teachers to steadily migrate from the struggling schools to the successful ones. Not only do poor kids lose out — but their schools get fewer resources because they are left with less experienced and lower-paid teachers. The other problem is that the system of evaluating, recognizing and rewarding teachers is broken. Millions of teachers do a great job with students who are years behind — and help them catch up. But the current system doesn't recognize or reward or learn from that teacher. Great teachers are the unsung heroes in our society. We must do better for them, we must do better for our children, and we must do better for our country. We will work with administrators, unions, and elected officials to create evaluation systems that use multiple measures — from classroom observation and peer evaluation to attendance, classroom work, and test scores. We also must demand funding equity. In too many places, our poorest students and our poorest schools have been shortchanged by state and local funding systems and rules. We will require much greater transparency and action steps to address inequities in funding systems, to ensure low-income students and the schools they attend get their fair share of dollars. Equity also drives our call for high standards. When districts and states dummy down standards and tell children they are ready for college when they are not — we are in effect, lying to children and families. And those who are hurt the most are poor kids in inner-city and rural schools who are more likely to attend a school with low expectations. We have to stop lying to children, to parents and to ourselves by pretending that 50 different standards across 50 different states are going to make America competitive or help our children succeed in life. In basketball the basket is always 10 feet high. In football the field is always 100 yards long. A 3-pointer is always worth three points and a touchdown is always worth six. Only in education do we have 50 different goalposts. We tell children they are ready for college — when they aren't — and that's why so many of them need remedial education when they get to college. That's why so many of them drop out. Thankfully, our nation's governors and chief state school officers are working together to solve this problem by developing common standards that raise the bar and prepare every student for college and careers. Forty-eight states, 48 governors and 48 chief state school officers are leading this work at the local level and 23 states have already adopted them — not because of a federal mandate — but because of a growing understanding among our governors that we need to get better. We're also funding the creation of new and better tests that more accurately reflect how students and teachers are performing — and once we do that, we can do a much better job tracking student growth. Are the ones behind catching up? Are the advanced students being challenged or are they bored in class and tuning out? And are we closing the achievement gap? If you look at each school and each child — you will see isolated pockets of remarkable success -- students, schools and teachers that have closed the gap. The reason I am so optimistic is because we have never had so many gap-closing schools across the country. As we identify them and learn from them — we can eliminate America's achievement gap. But to do that, we must recognize and reward the schools that show the largest growth and the teachers making the largest gains. We can honor them, reward them or just give them more resources to replicate their success. That's a local decision. At the same time, the schools at the bottom — that continue to fail year after year — schools where as little as 10% of students are at grade level or less than half graduate high school — will get the resources they need to get better — but only if they are willing to change. It makes no sense to keep doing the same thing over and over again and expecting a different outcome. Schools must be willing to change — and do the kind of things they did at Urban Prep — lengthen the school day, offer tutoring, mentoring and be available after school to help students. At Urban Prep, they started talk about college the first day they show up as freshman. By the time they were seniors — they had their list — they had visited schools — they knew what they wanted and they went after it with everything they had. If having the students dress in a tie and jacket or having parents sign a contract to get their child to school on time every day — can help create a culture of success, schools should do it. We must stop making excuses for failure. And this is where I need your help. Community leaders and parents must demand and support this change. Turning around a struggling school is hard, hard work. And there is no simple formula. The work must be shaped at the local level with all of the stakeholders at the table. Having done this in Chicago for seven years in a row and having watched it happen in other cities around the country — I understand that the process is not always smooth. I know this organization was not happy about the process in New York and I appreciate that. Process is important, community input is essential and community leaders must be at the table. That was the clear message from your lawsuit and from the court's ruling. You also made it crystal clear to us in recent meetings at the Department and at the White House — that the community must be at the table when decisions are make around how to improve struggling schools. And we agree. So, today, I'm announcing that — based on your input and the very productive engagement we have had around the school improvement grant program — we will revise our ESEA reauthorization proposal to require parent and community input. That means notification, outreach, public input, and honest, open discussion about the right option for each community. This is really common sense and most superintendents understand this. But we also know this is very hard work and it's a challenge to build consensus around these very tough interventions. But with a quarter of our students dropping out of high school each year and half of those who continue their education dropping out of college — we cannot delay and we cannot retreat. So let's get the process right — and then let's make progress together. Right now, our administration is distributing $4 billion dollars to states all across America to turn around our lowest performing schools. Many of those schools are in inner-city communities and they disproportionately serve minority communities. We're offering up to $6 million dollars per school over three years — which is a lot of money — over and above what they normally receive. Our resources can help pay for better curriculum, incentives for staff, and more learning time. What they cannot buy, however, is courage, and that is what is needed to succeed. And that's where you come in. The local leadership can also choose from several different approaches to transition student achievement — and this is also where community input is essential. Some approaches require staffing changes and some of them don't. That's a local decision. You can also bring in an organization such as a charter school — and I want to take a minute to talk about charter schools because there is a lot of confusion. First of all, charter schools are public schools. They serve our children with our money. They are accountable to us — just like regular public schools. One big difference is that they have more autonomy. In many cases they hire non-union teachers — but not always. One of the better charter operators in the country is Green Dot in Los Angeles and they use union teachers. Many people forget that the charter school movement began with Albert Shanker, the legendary leader of the American Federation of Teachers. Like Urban Prep in Chicago — they tend to have a longer school day and a longer school year. Many of them are open on Saturdays. They are not always successful — but in some cases they are performing miracles and they overwhelmingly serve minority children in the inner-city. The best of them — like the schools in the Harlem Children's Zone led by Geoffrey Canada — go beyond the regular school day and provide social services as well as parenting classes for young moms. They stay with them every step of the way, from Baby College to real college. We are now launching a new federal program called Promise Neighborhoods — modeled on the Harlem Children's Zone to integrate social services and education from birth. I am a big fan of Geoffrey Canada and the Harlem Children's Zone but let me absolutely clear about charter schools: I have said repeatedly that I am not a fan of charters — but I am a fan of good charters — just as I am a fan of good traditional schools. I don't care whether a school is a charter school or a traditional public school. Kids don't care either. They just want a good school. My only goal is success. If we want our children to compete in the global economy, we cannot tolerate failure any longer. We must demand excellence and not get sidetracked by ideology or politics. I know what's possible when people come together and demand educational excellence. I know what's possible when the strongest voices in the community unite for children. I'm here today to ask you — in your role as community leaders, and as historic change agents -- to join me in shaping our destiny — by meeting the President's challenge and making educational equity and excellence — not just a goal — but a movement. I'm asking you to place education at the very core of the NAACP's agenda and to raise your voices for reform in your communities. When we ask states to adopt higher standards, those standards are most important to ensure high expectations for students who have been left behind. When we invest in dramatically changing our lowest-performing schools — those schools are in minority communities, serving minority students, who aren't getting a fair shot at success in life. When we develop fair ways to identify our best teachers, we can use that information to ensure our neediest students are being taught by the teachers they deserve. And when we invest in a longer school day, and wraparound services — it is all to ensure equity for all of our students. You stood up for freedom and the right to vote — the right to fair justice and the right to fair housing. On education, you must bring the same urgency and unwillingness to compromise. When our children are being cheated of a quality education — we all must demand excellence — and demand equality. The fight for education reform will be won school-by-school, and community-by-community. But it will only be won if leaders are demanding it and defending it. The fight for a quality education is about so much more than education. This is a daily fight for social justice. No other issue offers the same promise of equality as education. No other issue can end the cycle of poverty — teenage pregnancy — the prison pipeline —∏ and the social sickness plaguing broken communities. This is not just a moral obligation. It's an economic imperative. We not only should improve education. We must improve education. We don't have a choice if we want America to be strong and we want all Americans to share in the American dream. Now, I want to close with a personal story that started in a church basement on the South Side of Chicago. In 1961, before I was born, a neighborhood pastor asked my mother to teach summer Bible study to a group of nine-year-old girls. The group had only one Bible, and my mother figured everyone could read a few sentences and then pass the Bible to the next girl. My mother was horrified when she discovered that none of her students could read. She decided to do something about that—and opened a free, after-school tutoring program — and from the time we were born, my brother, my sister, and I went to my mother's after-school program every day. When we were little, the older students tutored the younger kids, and as we grew up, we tutored the younger students. Her philosophy was that everyone should be both teaching and being taught at the same time. It wasn't always easy for my mother. Her program was fire bombed and her life was threatened. But, over time the community came not just to embrace her, but to protect her. And forty-nine years later, she is still going strong. From one corner of 46th and Greenwood on the South Side of Chicago, some remarkable success stories emerged. The teenager who tutored my group when we were growing up, Kerrie Holley, today is an IBM engineer who was named one of the 50 most important black research scientists in the nation. Another student became a brain surgeon. Michael Clarke Duncan pursued his dreams in Hollywood, where he starred in "The Green Mile." Ron Raglin eventually helped me manage the Chicago Public Schools. What I witnessed throughout my upbringing was the extraordinary power of education to transform lives. Poverty, community violence, single-parent households — they are all real challenges that we must confront every single day. But they will never define destiny. Opportunity, not poverty, shapes and molds the destiny of our nation's children. This is in our power to control and we have a responsibility to apply ourselves fully to this solemn task. Education is really unique among issues in that everyone has a role to play. We can't all find the cure to cancer or invent the next computer — but everyone one of us can help advance learning — whether it is with one child, one classroom, one school or one city. Education is everyone's responsibility. Education is our national mission. Education is our best and only hope for achieving the more perfect union at the heart of the American promise. For 101 years, no one has understood this more than the NAACP and I know that — no matter how hard this work and no matter how long this journey toward educational equity — you will always be setting the pace, lighting the path, and leading the march. I am proud and honored to march with you. Jim Horn teaches at Cambridge College in Cambridge, MA and contributes to Schools Matter. He may be reached at ontogenyx@gmail.com.